Laminated spruce top and mahogany sides and back. Includes injected molded case and Grover tuning machines. This beginner's method presents clear, concise instruction for learning to play the traditional three-stringed mountain dulcimer. Thirty-eight songs are taught with notation and fret numbers for each note. Chord symbols are also included. Melody playing with drones and basic chord playing are both taught. 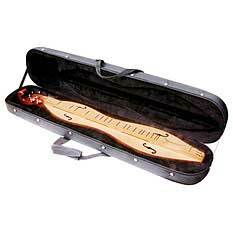 This book was written as a basic guide and source book for all dulcimer players, from novice to advanced picker. With its 53 songs in various modes and tunings, The Complete Dulcimer Handbook is a songbook, a lesson plan book, and a step-by-step guide from beginner to intermediate or advanced level.